Bridge up to four telephone lines through to nine stations, and operate up to nine separate telephones from this easy-to-use 110 style module. Unit comes with brackets. Operates up to nine separate telephones with four separate telco lines. 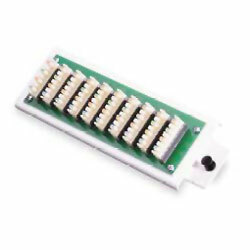 Printed circuit board with ten bridged 4-pair 110 type insulation displacement connectors. Suitable for phone, fax or modem.